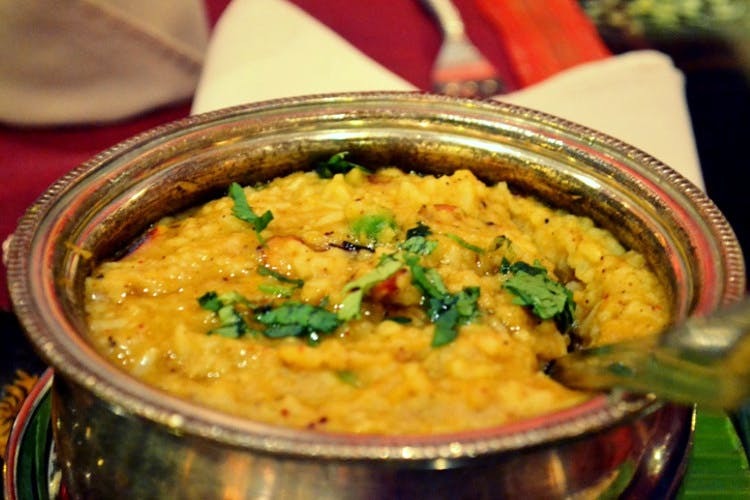 Looking for the best sambhar rice in Hyderabad? Then head straight to Chaitanya Food Court in Kukatpally. Not just that, this restaurant will get you hooked to its Andhra food (Like the Ulavacharu Chicken Biryani) in no time. Chaitanya Food Court is located right opposite Forum Mall, so the next time you're on a shopping haul — don't forget to indulge in some delectable Andhra food too. The place is modest in its decor, but it has a private dining area and a rooftop bar. We say, skip the starters and go straight for Sambar Rice and Ulavacharu Chicken Biryani. The Sambar Rice is mixed with generous amounts of ghee and is to be eaten with bites of fried red chilly on the side. The vegetables in the sambhar are tender and it has cashews too. The Chicken Ulavacharu Biryani has a tangy and sour taste, and if you love your biryani with a twist, this one's for you. If you're looking for offbeat dishes, they have options like Mint Biryani and Matka Kodi Pulao, for you to try. Wrap up your meal with a glass of mango lassi or buttermilk. This is paradise, we're telling you! Service is a bit slow.